The Parking Prankster has learned that parking operator UKCPS has been handing out fake POPLA codes. This is apparently a cynical move on UKCPS's part - handing out a fake POPLA code will mean it will be rejected by POPLA and may then mean a valid appeal cannot be lodged within the timescale or that the motorist will simply give up. How to recognise a fake POPLA code. All genuine POPLA codes are 10 digits long, and their format is described in a previous post. The fake POPLA codes are 9 digits followed by 1 letter. They therefore fit on the form, but will of course always be rejected by POPLA. The last 3 digits are your place in the number of appeals UKCPS turned down that day. 'P' is therefore obviously invalid and there can be no justification for UKCPS trying to manipulate the system in this way. It is noticeable that the instructions UKCPS provide for using POPLA only mention the online appeal service. Appealing online will of course fail to even get the appeal registered because the POPLA code is not valid. All rejection letters should also contain details on how to appeal by post - it cannot be expected that ever motorist has access to a computer. Appealing by post will at least get the appeal logged by POPLA. 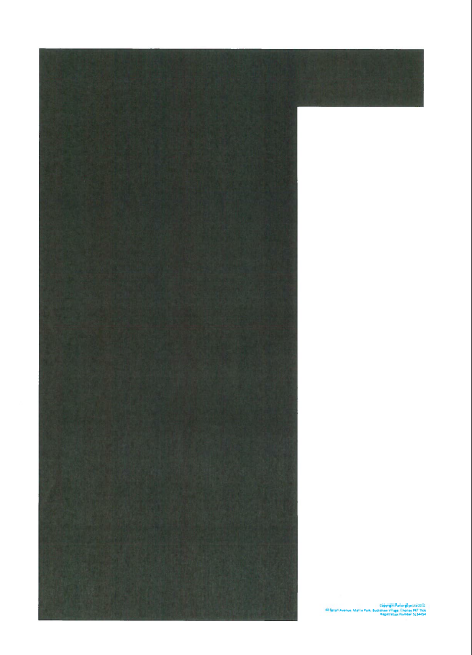 As a further example of UKCPS's attempt to bend the rules, The Prankster has seen the full unredacted latter and can confirm that the POPLA code was generated several days before the rejection letter was dated and posted, thus eating away appeal time. If you have an invalid POPLA number, contact Richard Reeve, POPLA Tribunal Manager, on 0207 520 7202 and ask him to log the fact that you have attempted to appeal but have not been given a valid POPLA code, and that in any case the POPLA code was generated several days before it was posted. 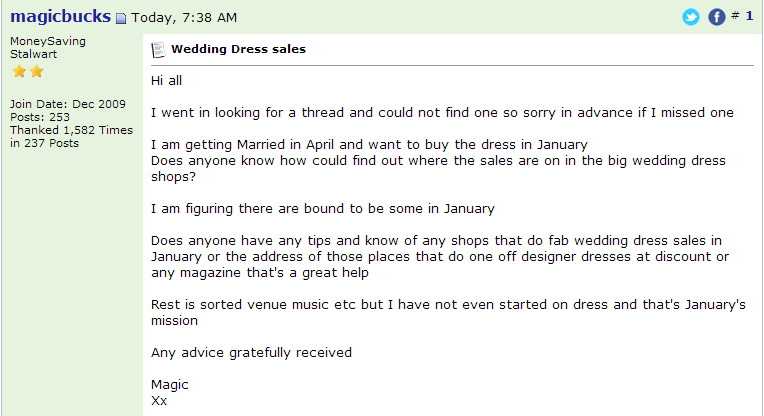 Richard Reeve and his team are well aware of this scam and will know the right procedures to follow. To be doubly sure, write to POPLA with a copy of your UKCPS rejection letter and get a free proof of postage. The BPA Ltd are well aware of this scam but so far have taken no public action. To be fair to motorists they should require UKCPS to contact all motorists who have been given invalid codes and re-issue valid codes, properly dated with 28 days to appeal, and with instructions on how to appeal both online and via the post. Any motorist who has paid should still be given the chance to appeal even though POPLA do not normally allow this. 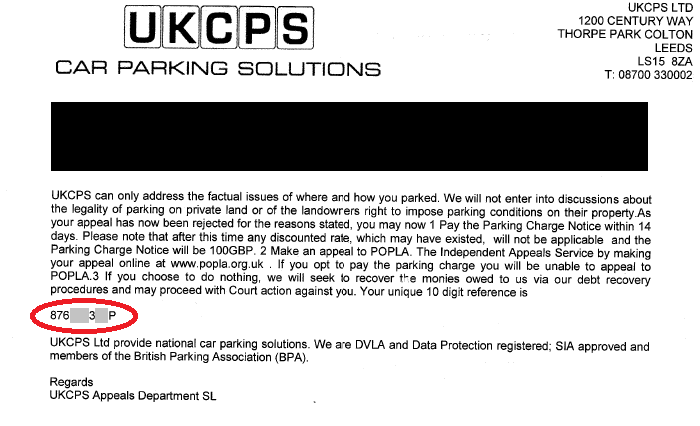 Email them at aos@britishparking.co.uk enclosing a copy of the UKCPS rejection letter. Ask them to explain why UKCPS are issuing invalid POPLA codes. Ask them to explain why UKCPS are also creating POPLA codes several days before they send them out. Ask them to explain why they have not required UKCPS to proactively already contact you, since the BPA are fully aware this is happening. The DVLA are responsible for letting the BPA Ltd police their members. As the BPA Ltd are not currently pulling their weight, you should email foi@dvla.gsi.gov.uk, enclosing a copy of the UKCPS rejection letter. Ask them to investigate why the BPA Ltd have taken no visible action so far to resolve this, and ask that as the BPA Ltd are apparently not regulating the sector correctly whether their ATA status should be investigated. The Parking Prankster is now officially banned from all parking related activities until Dec 27th by Mrs Parking Prankster. Merry Christmas to all readers! Even Rachel. The Parking Prankster is now off to indulge in a mince-pie and wine related activity from which he hopes to recover in the near future. Trivial Pursuit may also feature at some point. 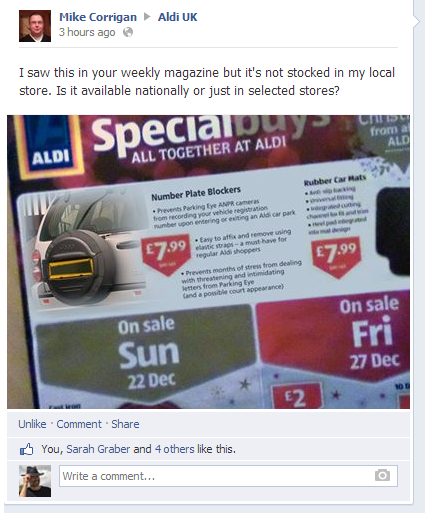 The Parking Prankster saw this product on the Aldi facebook page. At £7.99 this is surely the must-have stocking-filler this Christmas. PS: if you don't have one of these, then visit ParkingCowboys, moneysavingexpert or pepipoo. Currently they help get 100% of ParkingEye charges cancelled because they have been found to be legally unenforceable. With nearly 100 reported success stories and no failures, visit these sites and spread the word to your friends and family to make sure that the £100 stays out of ParkingEye's bank account and in your pocket. Parking companies are fond of quoting the cost of ANPR cameras as justification for their parking charges. The Prankster wondered just how much an ANPR camera did cost, so typed 'buy cheap anpr' into google. It turns out a high spec ANPR camera costs around £100-£300. So basically, after the first 1-3 suckers* pay out, the system is paid for. 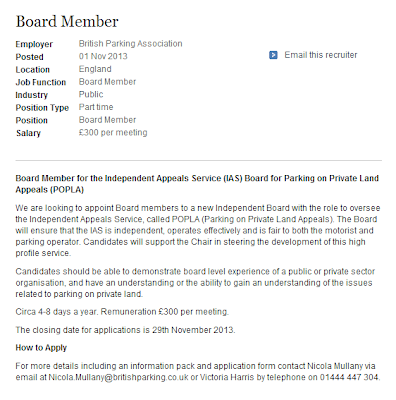 The British Parking Association Ltd recently advertised for board members to oversee the Independent Appeals Service, POPLA. The Parking Prankster considered this to be an excellent position for his many talents, and as he was eminently suited to the job, applied for the post. The Prankster considered that he could do more good for the motorist working inside the industry rather than outside it. Although the Prankster's application was received and read with great interest, sadly the post captured the attention of many people more talented and more suited to the post then The Prankster. The Prankster therefore recently received an extremely courteous rejection letter informing him that he has not made the interview stage. The Prankster wishes the new IAS board well, and will no doubt be in touch in the near future with his ideas for continuing to improving the service. Dogged campaigner martmonk has unearthed figures showing that the Northumbria NHS has targeted the sick, the injured, the elderly, new mothers and the disabled (in other words, your typical hospital patients) for an estimated annual figure of £1 million in parking fines to save the £70,000 it cost them to run a car park barrier system. The hospital itself does not profit, but passes the money on to car parking company ParkingEye. The system ParkingEye have installed uses a scattergun approach, issuing charges whether or not they are justified. Well over half the tickets issued have to be subsequently cancelled. In some car parking areas the figure is higher than 80%. It is likely that most of the other tickets would be cancelled too, but many vulnerable people are scared into paying instead of appealing because the fines increase dramatically after 14 days. 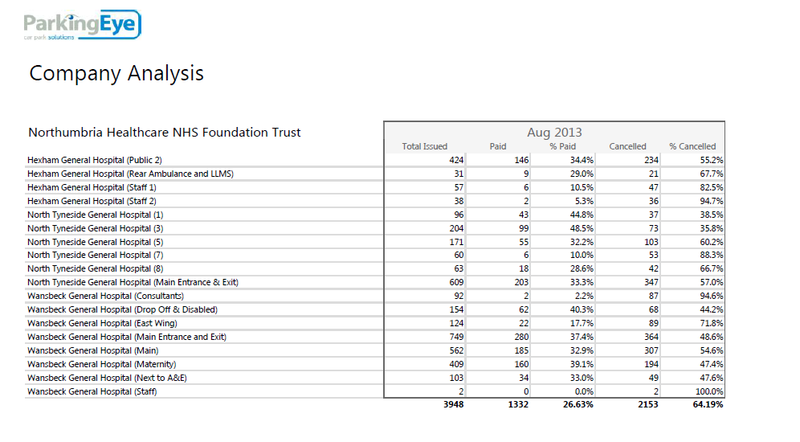 Extrapolating for a whole year of data gives us a minimum of (£154,160 + £0) x 4 and a maximum of (£269,780 + £161,490) x 4. This works out as between £616,640 and £1,725,080. The Prankster thinks the likely total sum will be more than £1 million. The hospital trust chose ParkingEye to replace the previous barrier system which was costing £70,000 to run. ParkingEye promised free car parking management. It is now clear that the car parking management is not free at all, but that the entire cost has been passed on to the patients of the hospital, at a price around 20 times greater than it cost the hospital to run the system. It is also clear this system is not fit for purpose. Huge numbers of tickets are being incorrectly issued, and the vulnerable and sick are targeted. It is instructive to note that in the consultants car park 92 tickets were issued in August and all but 2 cancelled. Consultants are obviously well aware that these tickets are bogus and have no hesitation in getting them cancelled. Time after time The Prankster finds it is the more vulnerable members of society who are frightened into paying these tickets. What do Northumbia NHS think? 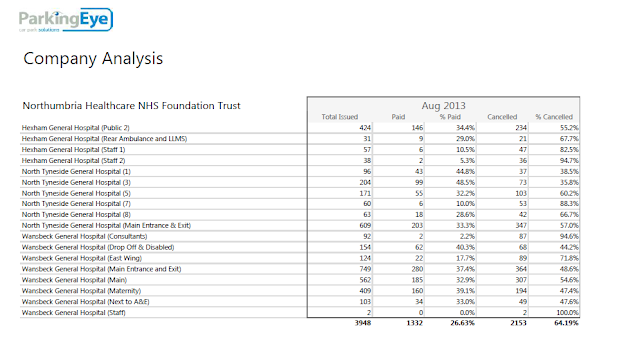 It is instructive that the Northumbria NHS view the charges as fines. Parking charges on private land are not allowed to be penalties or fines; this therefore makes them unenforceable. The legal case the Northumbria NHS quote to justify their charges is extremely ironic. This case was actually about ParkingEye suing Somerfield for cancelling their car parking contract. Somerfield had to pay ParkingEye £350,000 - something the Northumbria NHS will need to bear in mind. Somerfield cancelled the contract due to the sharp practices of ParkingEye. Some other quotes from that case from Sir Robin Jacob (quotes the NHS seem not to have used) are as follows. 6. Under the contract, ParkingEye provided all the equipment and were responsible for its operation. It received no payment from Somerfield for this. Instead it was entitled to retain all the “fines” collected. So of course ParkingEye had an incentive to operate the “fine” system aggressively. 7. This it did – too much so: some of the letters it wrote to motorists contained falsehoods. 9. The third letter was different. This was held to contain serious falsehoods. 13. The Judge not only found that the third letter contained falsehoods but that those falsehoods were deliberately made by the relevant ParkingEye executive, albeit without dishonesty. Hence the Judge found ParkingEye was guilty of the tort of deceit on those occasions when the third letter was sent on its behalf. ParkingEye does not challenge this decision. The Northumbria NHS are apparently not too hot on legal issues. The quote from HHJ Hegarty QC was not relevant to the main issues of the case and therefore does not form a necessary part of the court's decision. The technical term is 'obiter dictum'. It is therefore not binding and not even relevant. The Northumbria NHS quote several other cases from Combined Parking Solutions, but these are all cases to do with contractual issues, not breaches of contract. These are therefore not relevant in the slightest. In short, the Northumbria NHS do not seem to have a grasp on the issues. ParkingEye's charges have all been found to be legally unenforceable by the industry standard adjudication body, POPLA. To date, over 80 verdicts have upheld this, with none in favour of ParkingEye. Patients from Hexham General Hospital, North Tyneside General Hospital and Wansbeck General Hospital should therefore appeal first to ParkingEye and when their appeal is rejected, take the case to POPLA, quoting the reason for appealing is that the charge is for breach of contract but is not a genuine pre-estimate of loss and ParkingEye have not provided a breakdown of their charges. As ParkingEye are raking in £1 million for supplying a few signs and cameras it is obvious they are making vast profits here. POPLA see through them every time, and so far uphold all appeals on this basis. If you do reject the challenge and insist upon taking the matter further I must inform you that I may claim my expenses from you. The expenses I may claim are not exhaustive but may include the cost of stamps, envelopes, travel expenses, legal fees, etc. By continuing to pursue me you agree to pay these costs when I prevail. As the landowner Northumbria NHS are equally liable, so the patient should also appeal to the trust, using the same wording. 19.5 If the parking charge that the driver is being asked to pay is for a breach of contract or act of trespass, this charge must be based on the genuine pre-estimate of loss that you suffer. Both these organisations take a 'laissez faire' approach to enforcement, relying on consumer complaints to identify problems. They welcome complaints of this nature otherwise they would never find out about problems. Patients who have already paid the fines should request a refund. As the landowner the Northumbria NHS is jointly responsible, so the patient should contact the Northumbria NHS to get their money back. The Parking Prankster has previously blogged about motorists successfully reclaiming costs when a parking company issues a charge which has no basis in law. 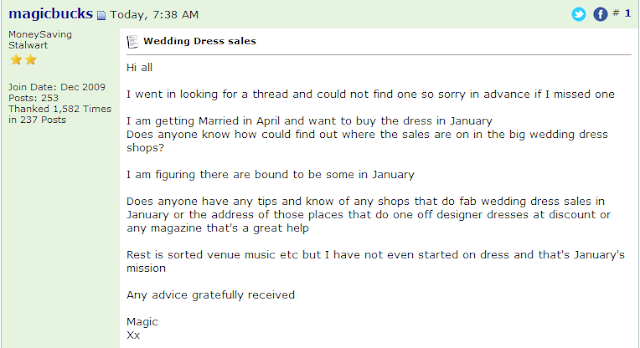 Yesterday The Prankster blogged about another such challenge which is currently under way. If you are a motorist and have been issued with such a charge, you will be far more likely to be able to successfully reclaim costs if you have established a proper foundation from the start. A suggested text to add to your appeal to the operator is as follows. Obviously it is not right that some parking operators continue to knowingly issue charges when they have no basis to do so, and when their charge levels have consistently been rejected by POPLA in every appeal since its inception in October 2012. This is unjustly causing motorists time and effort to fight charges which are bound to be cancelled by POPLA. Moreover, many motorists who do not know the charges are not valid may be frightened into paying up. The Prankster sees this time after time, especially with the more vulnerable members of society. The Parking Prankster recommends that every motorist adds the above text to their original appeal to the parking operator. 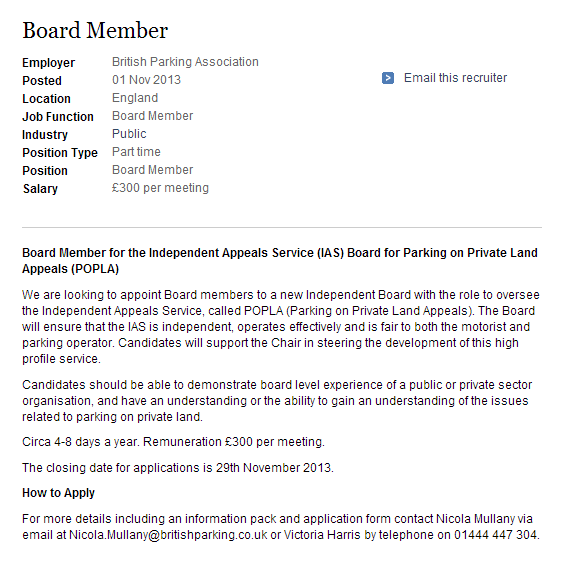 Once the POPLA appeal is upheld, the motorist can then decide whether to pursue the parking company for their expenses. If you are currently have an appeal in with the operator, but have not yet received your POPLA code, send in the above text as soon as possible. If you currently have your POPLA code but have not yet filed your POPLA appeal, send in the above text with the stipulation that they have seven days to cancel without incurring expenses, otherwise you will then file your POPLA appeal. Obviously make sure you still appeal to POPLA within the timeframes; you can check your POPLA code here. One definition of insanity is to keep repeating the same action, yet expect a different result. ParkingEye have now contested over 80 cases at POPLA where their charge level was contested, and the score is currently Motorists 81 ParkingEye 0. 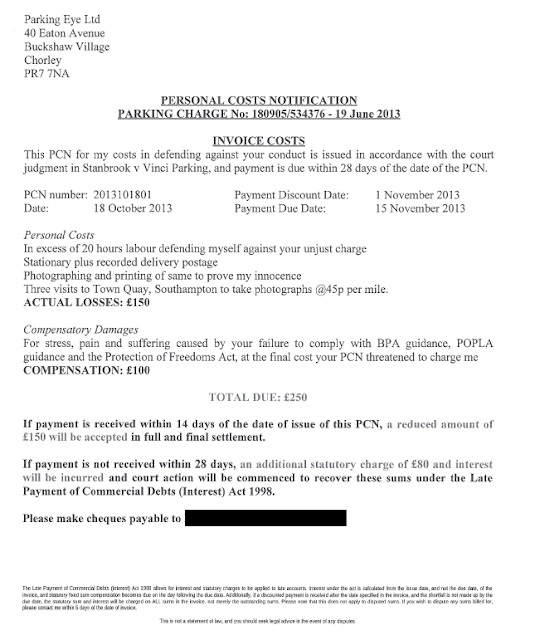 Motorists can therefore feel fairly aggrieved that they have to spend time and effort preparing a POPLA defence when ParkingEye have no chance of winning; ParkingEye's accounts show they make a profit of over 30% on parking charges and as they are required to be a genuine pre-estimate of loss this is an obvious impossibility. One motorist therefore warned ParkingEye that if they refused to cancel his charge and that he was forced to continue to POPLA he would charge them for his time and effort if he won. ParkingEye refused to cancel the charge. The motorist appealed to POPLA and won, and duly issued his invoice to ParkingEye. ParkingEye ignored the invoice and all subsequent communications and hung up the phone whenever the motorist tried to contact them. This is surprising, because in all their court documents ParkingEye roundly lambast motorists for ignoring letters that they send. 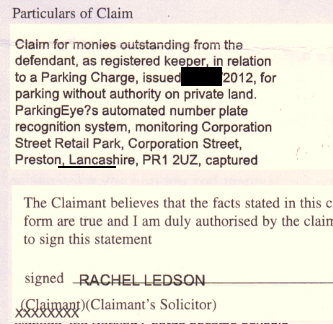 In the end, as a last resort, the motorist has been forced to issue a court claim against ParkingEye. The Parking Prankster will follow the case with interest. ParkingEye now have 14 days to acknowledge the claim or face default judgement. Will ParkingEye finally spring into immediate action? Will they pay up? Will they attempt mediation? Will Capita send a few lawyers over to help out? 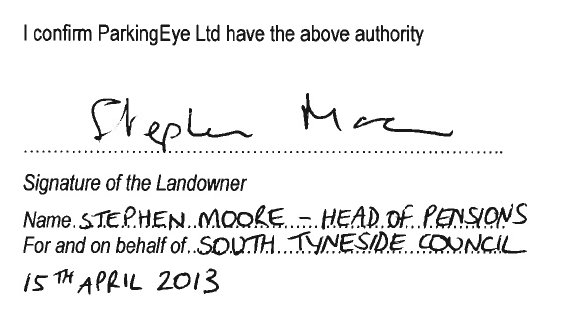 Will ParkingEye use a photocopied signature on their witness statement or will they follow proper procedures? A post on pepipoo suggests that UKPC are considering following ParkingEye's lead and issue court claims in bulk. This is an extremely profitable activity for parking companies because many people are scared by the mere threat of court and so pay up straight away. The parking company can add fictitious amounts onto the claim, vastly improving their profit margin. Most people are unaware that companies such as ParkingEye will actually settle the claim for much less than the numbers on the court claim form, because otherwise they lose vast amounts of money if the claim progresses to a hearing; money they cannot reclaim because the small claims court limits costs. This is early days yet, so we still have to see what exactly will happen. The current situation is that UKPC have assigned debt collectors Debt Recover Plus to chase up old debts (from 2012) by writing threatening letters; they say the case will be passed to LPC Law to take further action on behalf of UKPC. The Prankster wonders how this will turn out for UKPC - a couple of letters from LPC Law will soon see their charges swallowed up. So, what should people who receive these letters do? The Prankster does not know at this time. If UKPC are bluffing then the letters could be ignored. If UKPC really will do court, then they should send a Letter Before Claim first. However, as we have seen from ParkingEye, many of the letters they claim to send are never received. 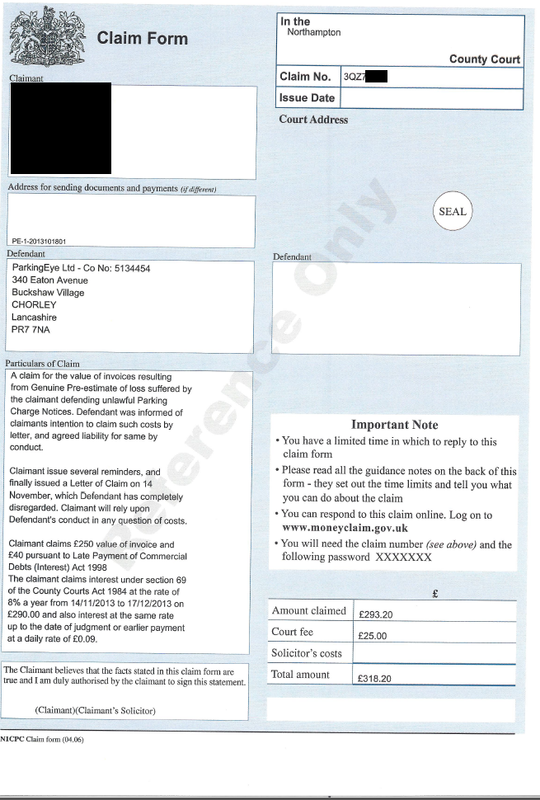 The Prankster, in this situation, would take the initiative, write to the debt collector stating that any debt is denied, and write to the operator, appealing the charge and asking for a POPLA code; meanwhile also stating that any legal action should be preceded by a letter before claim complying with practice directions. However, everybody will have to make their own choice until we see how things pan out. The Parking Prankster has seen the pre-estimate of loss calculations for two different companies, Vehicle Control Services and Excel Parking. There are 12 categories of costs and amazingly each category comes to the same amount, calculated right down to the penny. Most of the amounts and categories can be seen in this post. Aha, says the well-informed reader - VCS is 100% owned by Excel Parking. That surely explains everything. Not so, replies The Prankster. Just because one is 100% owned by the other does not mean that they share the same books. Both companies file different accounts and have different methods of operation. VCS for instance, patrols several airports with periscope cars, and as has been reported, pays the airport for the privilege of issuing charges. Excel Parking manages centers like the Peel centre, and is paid a sum of money for doing this. Each company will have different rates at which motorists pay up, go to POPLA, and so on. The Prankster can scarcely believe that the pre-estimate of loss calculation is the same for both companies. The Parking Prankster has seen the figures the DVLA released regarding complaints about private parking companies. However, this does not seem to tally with the number of actual complaints made. The figures the DVLA release seem to be woefully understated. The Prankster can then use this information to help the DVLA make their figures more accurate. The Prankster is currently collecting information on Vehicle Control Systems and Excel Parking POPLA cases, for reasons later to be revealed. The Prankster is collecting information on Civil Enforcement Limited. This company issues large numbers of court claims, but then discontinues if a sturdy defence is produced. If this happened to you, The Prankster would like to know. Please email your claim reference number, the date of your hearing and the date CEL folded to prankster@parking-prankster.com. The Prankster can then collate this information with a view to analysing whether CEL are vexatious litigants or not. If you actually made it to a hearing The Prankster would like to know as well, together with the outcome. This newspaper report tells the tale of parking at Queen's Hospital. ParkingEye were bought in to enforce maximum value, but instead targeted vulnerable people causing countless complaints. The system required motorist to know how long they had stayed for, but provided no information allowing the motorist to calculate that. Countless people therefore either overpaid or underpaid. The chief executive has now suspended all penalties while a review takes place. She will find it a little difficult to get rid of ParkingEye; when Somerfield tried it cost them a pretty penny. Were ParkingEye operating without written authority at Corporation Street Retail Park, Preston, PR1 2UZ? The Parking Prankster has been made aware of a freedom of information request which suggests that ParkingEye have been operating without written authority at Corporation Street Retail Park, Preston, PR1 2UZ. The FoI request asked the council for their contract with ParkingEye. The council replied. The requester noted that the contract was dated September 2013, and asked for previous contracts. So The Prankster wonders, if there was no contract in place, as confirmed by Rachel Ledson, why were parking charges being enforced before 15th April 2013. Presumably there was also no written authorisation in place, otherwise there would be no need for new authorisation. The Prankster wonders if no authorisation was in place, why Rachel Ledson has been busy issuing court claims for parking events that happened back in 2012. The Prankster also wonders if no authorisation is in place, why Nicola Rawlinson, Principal Solicitor for Tyne and Wear Pension Fund has been busy signing witness statements for ParkingEye court cases saying that there is written authorisation. Well, it's all very confusing, with a lot of contradictory statements from ParkingEye, the council and the pension fund. No doubt the council can sort this all out and send The Prankster a copy of the missing 'authority' to his usual address, prankster@parking-prankster.com so that he can clear matters up on behalf of his readers. The Parking Prankster has learned that ParkingEye have set times and grace periods so that disabled, elderly and other slow moving people are trapped into paying parking charges at The Range, Barrow-in-Furness. Moreover, their callous appeals process deliberately fails to respect that some members of society are not as able as others. Luckily for the motorist, POPLA does take this into account, as the following verdict shows. The Operator issued parking charge notice number [redacted] arising out of the presence at The Range in Barrow-in-Furness, on 5 July 2013, of a vehicle with registration mark [redacted]. It is the Operator’s case that a parking charge notice was correctly issued,giving the reason as: ‘By remaining at the car park for longer than the stay authorised or without authorisation, in accordance with the terms and conditions set out in the signage, the Parking Charge is now payable’. The Operator submits that a parking charge is now due in accordance with the clearly displayed terms of parking which state that parking is only permitted during store hours. It is the Appellant’s case that he parked in order to use one of the shops located on site. Having got out of his vehicle and approached the store, he found that it was closed and so returned to his vehicle and left the site. The Appellant submits that, as he is 82, this took him longer than usual. The Operator has produced evidence that the Appellant remained in the car park for 11 minutes. to accept his evidence that he left the car park as soon as reasonably possible after becoming aware that he could not park. Well done Mr Adamson, and one happy pensioner is thanking you today. As ParkingEye were fully aware that the motorist was a pensioner, The Prankster considers that their appeals team needs retraining. 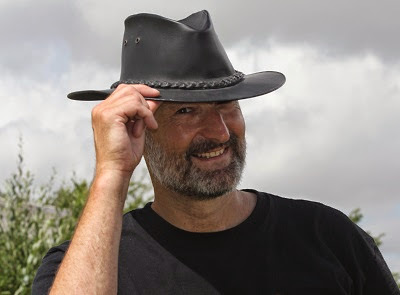 The Parking Prankster has learned that ParkingEye has refunded £60 to an elderly couple in their 90s who fell foul of the time limit at The Range. This is an unusual case. The appeal did not happen until after the £60 was paid, and parking companies are usually fairly hard hearted in these circumstances. The Prankster commends ParkingEye for this action. As ParkingEye currently uphold over 55% of appeals The Prankster feels it would be helpful for ParkingEye to be more explicit over the possible reasons for appeal on their charge notices and their web site. After all, if over half of their tickets are wrongly issued it would be helpful to all parties if all incorrectly issued tickets were cancelled, and if this was done as early as possible in the appeals process by encouraging motorists to engage as soon as possible. If ParkingEye are forced to cancel tickets later on, it causes costs and wasted time for all parties.